Last year Michael Caine won it. This year it could be one Dave Johns who claims the top acting prize in the European film awards next weekend. His starring role in I, Daniel Blake has taken him and everyone else involved on quite a journey. Clinching the Palme d’Or at the Cannes film festival was only the start for this remarkable film. Now Johns is having to fit in his regular work as a stand-up comic in the North East with requests for interviews from all over the globe. Not to mention dusting off the DJ for those award ceremonies. It’s not bad for a low budget film that’s a fairly straightforward tale of hard up folk struggling to get by. But for Johns that’s the whole point: the characters are very ordinary people. ‘It could be your daughter, your sister, your grandkids,’ he says. For him that’s where the power of the film lies and why it has struck such a chord with audiences in the UK and internationally. The whole shebang got started when Johns heard that director Ken Loach was looking for someone to play a 59-year-old Newcastle joiner having a tough time with the benefits system. He had done some acting before and loved it. So he was determined to give this his best shot – and he got the part. There was no chance to research it though: Loach shoots his films in the same sequence as the story unfolds. The actors got the next section of scripts each day on set. So the shock and bewilderment on Daniel’s face as he confronts each Kafkaesque twist at the Jobcentre is pretty authentic. ‘Each day you are living the life of Daniel as it’s revealed to him more and more.’ In fact, says Johns, researching the benefit system beforehand might have blunted that honest reaction. The film tracks Daniel Blake’s attempt to claim Employment and Support Allowance after a heart attack – but he has to wait until a ‘decision maker’ decides. He is advised to claim Jobseeker’s Allowance in the meantime but can’t take up any jobs because his doctor says he’s not well enough. At the same time, lone parent Katie (played by Hayley Squires) feels marooned in Newcastle after moving there from a homeless hostel – her London local authority cannot find her and her two kids permanent accommodation. Some of the scenes in the film are reminiscent of what participants in our own research told us. Some lone parents, for example, described going without food themselves in order to feed their children. Johns’s education in the ways of ESA began when Loach gave him a 52 page application form and told him to fill it in. He couldn’t. That was an awakening for a man who last claimed unemployment benefits in the 1970s. In the film we see Daniel and Katie struggling to deal with a bureaucratic system that wears them down to the point of feeling shame and desperation. The experience of filming that journey has left Johns fired up with outrage. First, he nails the way the system pushes responsibility back on to the individual recipient. Despite the many reported cases of similar situations, some have criticised the film, pointing out that it is fiction or saying it is exaggerated. Johns is having none of that. He points out the extensive research by Loach and writer Paul Laverty. People working on the film included ex-Jobcentre staff, and foodbank volunteers told the stories of those scenes, he insists. He believes that benefit recipients have been unfairly portrayed in the public mind as scroungers. ‘I don’t know any father or mother who would want to take their children to a food bank. To get free food – the indignity of that. And people who are working hand the money to private landlords, and they have nothing left at the end of the week. You can’t tell me that anybody wants to live like that. And of course wildly unexpected good things can happen too. 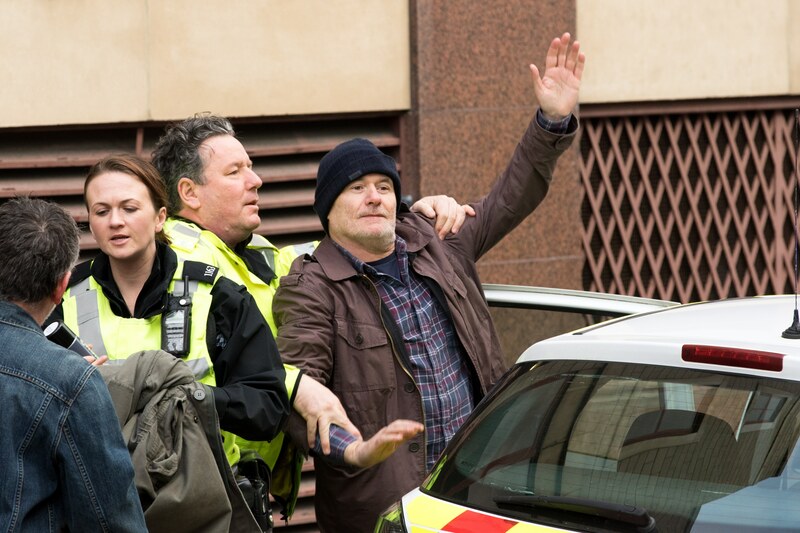 I, Daniel Blake has made the explosive leap from indie film to international event. Johns got out the suit again last weekend for another awards ceremony: this time the UK Independent Film Awards where he won Best Actor. ‘When I made this film last year I never dreamt of where it’s taken us. I’m very proud,’ he says.